Business Description: A revolutionary reward system for Breathing, Meditation and Yoga practice using Decentralized Blockchain Technology. Aldric Négrier and Luís Carlos from the CRIA incubator in the Portugal are the two promoters who dare to revolutionize the world economy. The ZenVow project fits in the FinTech’s preventive health sector. So revolutionary that it is hard to believe and understand. The technology behind the ZenVow project is based on BlockChain technology, Internet of Things and Artificial Intelligence. 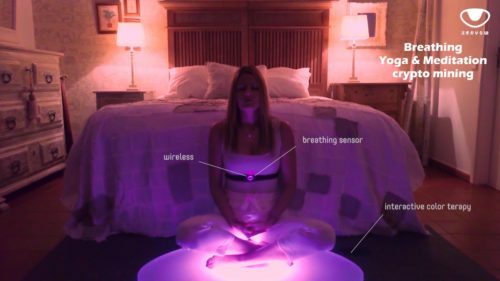 This revolutionary project aims to monitor and validate guided breathing, yoga and meditation exercises through a patented pending framework. After the validation of the sessions the system automatically rewards users with virtual coins called ZenVow coins, similar to Bitcoins. attempt to reduce the financial oppression created by the system, rewarding healthy scientifically proven activities. The projects main goal is to reward practitioners of yoga and meditation with crypto currency valued more than the minimum wage. In a second phase the project intends to build a meditation resort , where guests will have access to theoretical and practical classes of yoga and meditation, in exchange for crytopcurrency generated by their own exercises. The project has now been recently presented to more than 350 venture capitals all over the world.